In her formative years, Joan Bondurant dreamt of a career in music. Instead, she became a spy. Throughout World War II, Bondurant worked as a research analyst for the Office of Strategic Services in India, translating intercepted Japanese messages and documents. She later befriended Mahatma Gandhi and embarked upon a career of researching and teaching his philosophy of nonviolence. Now, in time for what would have been her 97th birthday, the Joan V. Bondurant Papers are fully processed at the River Campus Libraries and are available to scholars across the globe. Bondurant’s collection of personal papers was given to the Department of Rare Books, Special Collections, and Preservation in 2012 by her close friend and editor Edna Cardish, with the assistance of Allison Stokes, former director of the University of Rochester’s Interfaith Chapel and M.K. Gandhi Institute for Nonviolence. The collection is comprised of Bondurant’s correspondence, lecture notes, manuscript drafts, and several home movies. The papers also include numerous photographs from Bondurant’s service in the Office of Strategic Services. 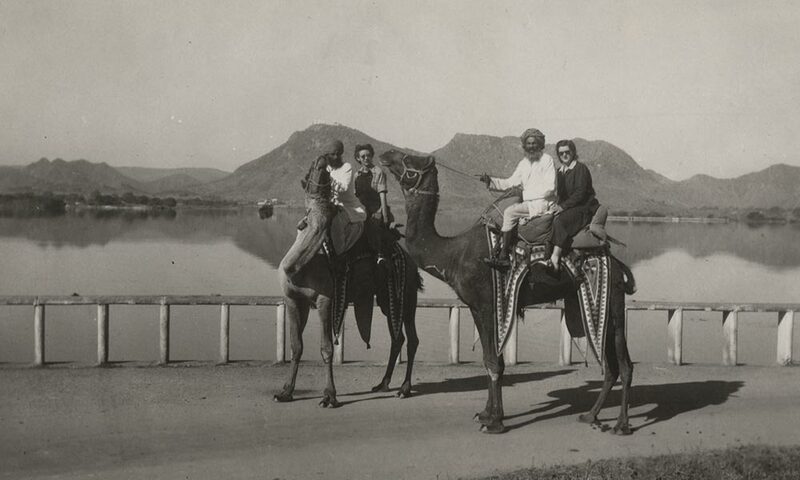 During her four years of field research in India, Bondurant developed a deep love of Indian life and culture. She became fascinated with the teachings of Mahatma Gandhi and his non-violent political influence within the country. She wrote extensively about conflict and conflict resolution, and about Indian government and politics. Her booklet, Sketches of India, was her response to the many friends who asked her to share in words and pictures her impressions of life in India. Her definitive work on non-violence, Conquest of Violence: The Gandhian Philosophy of Conflict, was published in 1958. Upon her return to the United States, Bondurant studied at the University of California, Berkeley where she earned a Ph.D. in political science in 1952. She joined the faculty at Berkeley and served as a research political scientist at the Institute of International Studies until 1970. From 1970 until 1973, she was a professor of comparative politics at the University of the Pacific in Stockton, California. Following her retirement, she lived in Tucson, Arizona until her death in 2006. In the short time that the Bondurant collection has been available to researchers, it has been accessed by a Bondurant biographer, showcased in the River Campus Libraries’ Around the World in Four Collections exhibition, and currently serves as the basis for a graduate thesis which is being written as part of the joint University of Rochester-George Eastman Museum Photographic Preservation and Collection Management Program. Most recently, the home movies have been digitized and will become available to the public in the coming months. To read more about the Joan V. Bondurant Papers, visit http://rbscp.lib.rochester.edu/4909.